More than 2,700 people were killed in the attack on the World Trade Center on Sept. 11, 2001. 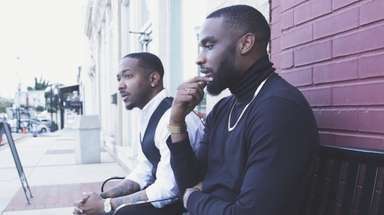 Their friends, family, neighbors and colleagues keep their memories alive through the days and years. 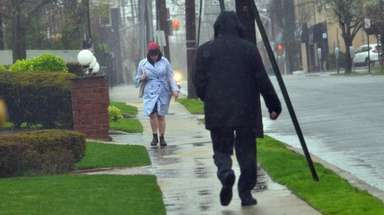 This week, Long Islanders and other residents of the metropolitan area shared the many ways they grieve, 15 years later. For Eva K. Gujral, whose little sister died at the World Trade Center, the hardest day she faces each year is not Sept. 11. It’s the day before. Manika K. Narula, 22, of Kings Park, worked as a data processor at the financial services firm Cantor Fitzgerald, on the 101st floor of the trade center’s north tower. She had been employed there for less than a year when the terrorist attack occurred. The spirit of Narula, known to family and friends as Mona, lives on when she is remembered in conversations and shared experiences, the sister said. 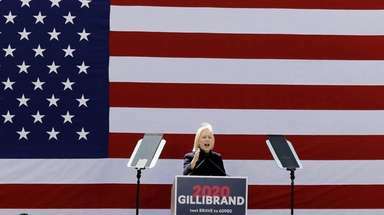 On Saturday, Gujral, her parents, her husband and their children gathered at the Gurdwara Guru Nanak Darbar, a Sikh temple in Hicksville, to mark the end of a three-day prayer ceremony in which all the verses in the holy book were recited nonstop by a team of readers. The ritual, considered very holy, began Thursday, with Gujral’s parents in attendance. Sunday, the family will gather at the National September 11 Memorial & Museum in lower Manhattan to remember Narula, the young woman who loved to dance. “We’ll go to the fountain. 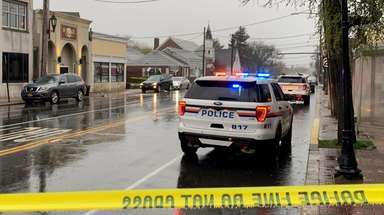 We’ll stand there together and pray for her soul and peace,” her sister said. Susan Hutchins plans to attend the ceremonies honoring Sept. 11 victims until the day she dies. 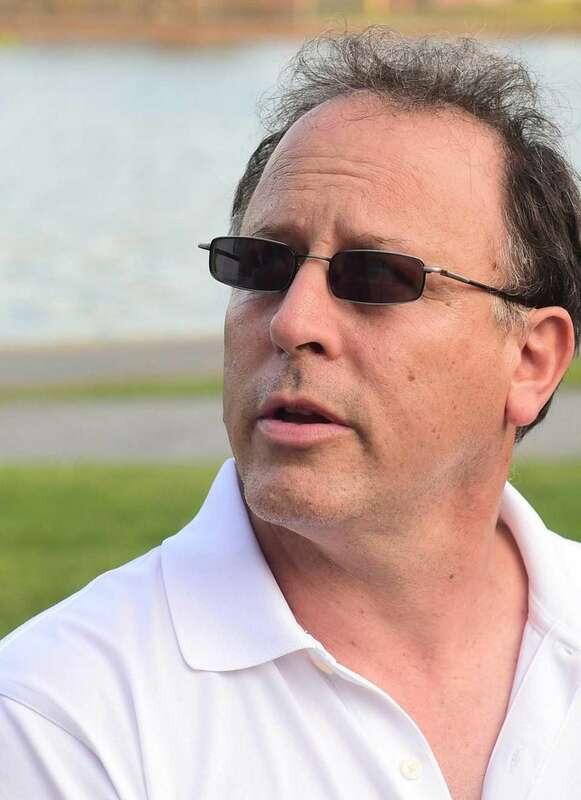 Hutchins’ son, Kevin Colbert, of West Hempstead, worked at the brokerage firm Keefe, Bruyette & Woods and was last seen on the 89th floor of the south tower. Hutchins buried her eldest son two months after the attack. But the New York City Medical Examiner’s Office would call every few weeks to notify her that additional remains had been identified. While she finds some solace in a memorial fund set up in Kevin’s name at his alma mater, West Hempstead High School, the pain remains raw. Carmine Albano, a porter at the National September 11 Memorial & Museum, was overwhelmed by his job at first. There were so many lives lost, so many names: 2,983 etched on the bronze panels that surround the reflecting pools of the towers’ two footprints. It is his job to polish those panels, to be certain those names are absolutely pristine. “For the first six months I was here, I really hated it,” the 28-year-old said early Saturday morning, standing beside the pool that symbolizes where the World Trade Center’s North Tower stood. Albano now cherishes his duty. Two blue microfiber cloths in hand, he moved from one panel to the next. With a gloved hand, he guided the fabric into the grooves, treating each name with care and dignity. “I get to give these people honor when they’re gone,” said Albano, of Port Chester, who was an eighth-grader on Sept. 11, 2001. It takes him 45 minutes to an hour to make his way around the panels. Depending upon how much debris has fallen from the trees and from the construction that continues around Ground Zero, he might do rounds with his cloths twice a day, and add a bit of water where needed. Saturday, as he worked, a couple from Canada paused before a panel. Albano knew what to do. “Don’t worry,” he told them. “I’ll come back.” And he gave them space for their thoughts. 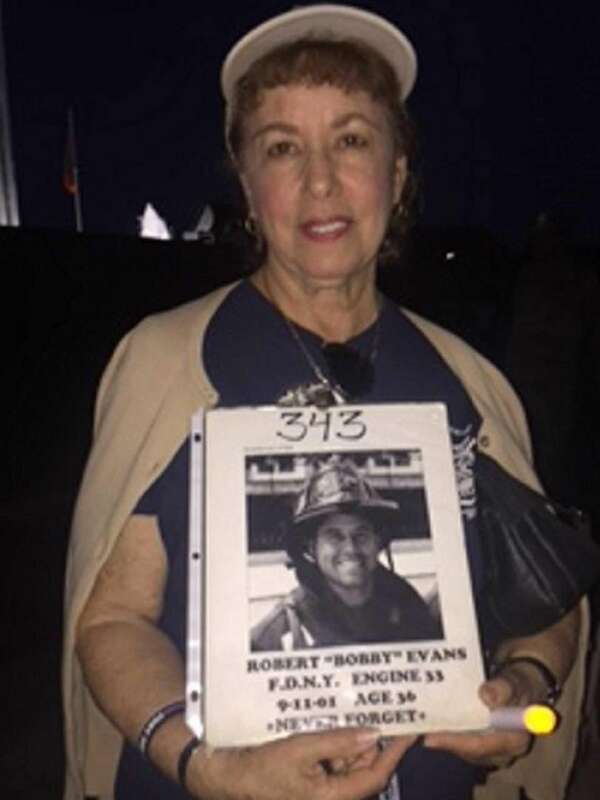 Clutching a photo of her son, Robert, and wearing an FDNY cap, Christina Evans still has trouble believing 15 years have passed since the attacks on the Twin Towers. 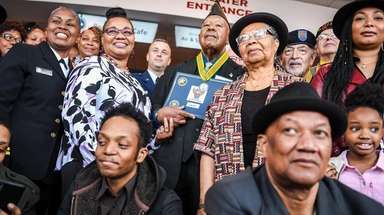 “In the beginning, it felt like a movie belonging to someone else,” she said while attending a remembrance ceremony in East Meadow, N.Y. on Thursday. Now, there are still moments when her grief is too much to bear. Robert Evans, then of Franklin Square, was a member of FDNY’s Engine 33 in Manhattan. He was killed leaving the north tower. His mother has been in support groups for victim’s families and finds comfort being around those who understand her pain. “I think about what he would be doing,” Evans said. “Would he be married? I miss him so much. Cathy Vichaidith came to the World Trade Center memorial on Saturday to tell her close friend Saranya Srinuan how the kids are doing. Srinuan, a Cantor Fitzgerald bond trader, was 23 when she died on Sept. 11, 2001. Her memory is very much alive for Vichaidith: She named her daughter, now 6, Saranya in honor of the vibrant young woman she considered a cousin. “I come here, bring some flowers for her, have a little chat,” said Vichaidith, 39, who grew up in Valley Stream, as she placed stems of white-colored roses upright in some of the 14 letters etched in bronze. The two weren’t cousins by blood. Their mothers attended nursing school together, so Vichaidith and Srinuan grew up as close as cousins. Vichaidith, now of Manhattan, credits Srinuan with nudging her to date the man who would become her husband. “I’m married because of her,” she said, eyes welling with tears. “I didn’t want to give him a chance, and she said, ‘He’s a really nice guy. Go on a date with him.’ She was right." Joan Keegan and Andrea B. Della Bella used to finish each other’s sentences. The two women, who grew up together in Hempstead, met up almost every weekend and spoke every day. They were planning to celebrate Keegan’s birthday later in September 2001. But the longtime friends never got to speak on Sept. 11. Della Bella had started working as an administrative assistant at Aon a few months after the 1993 World Trade Center bombing, and always felt safe at work, even though it made her friend nervous, Keegan said. “She always said, ‘I don’t think anything will ever happen again,’” Keegan said. When the first plane hit, Keegan and Della Bella’s husband made a frantic series of phone calls to each other and Della Bella’s office. Della Bella returned Keegan’s call, but spoke to Keegan’s husband to say she was OK, but leaving the building. It was the last time anyone heard from her. Now, Keegan goes to the 9/11 ceremony in East Meadow every year, to remember her friend, and the many others lost that day. “We were joined at the hip because neither of us had sisters,” Keegan said. “She was just one of the most beautiful people I knew." 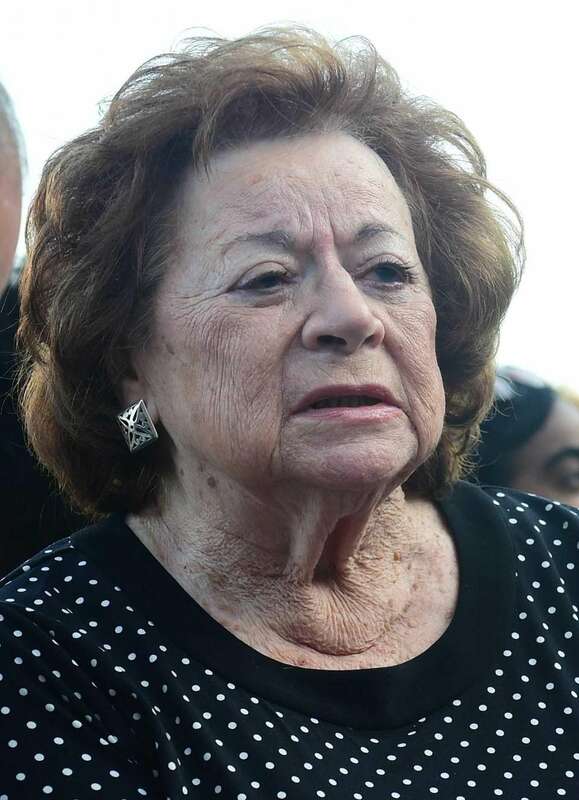 Marilyn Weinberg of North Bellmore tears up as she considers the major events her son has missed during the past 15 years: birthdays, anniversaries, his three children graduating high school and then college. Her son, Steven Weinberg was an accounting manager at Baseline Financial Services in the south tower on Sept. 11, 2001. Weinberg attends remembrance ceremonies every year and meets at a diner every other week with the mothers of other Sept. 11 victims. She said the shared sense of community ensures that her son is not forgotten. It took nearly 15 years for Jeremy Lipkin to return to the ground where the World Trade Center’s two towers once stood. Lipkin, 44, and his wife, Michelle, were living in an apartment on nearby John Street when a hijacked jetliner was flown into the north tower on Sept. 11, 2001. He was in the shower. After a second plane crashed into the south tower, Lipkin and his wife headed uptown to a brother-in-law’s home on Prince Street. The couple stayed at the New Jersey home of his wife’s mother for at least a week because much of the area around Ground Zero was uninhabitable. They have lived in two other apartments since then and have two teenagers, ages 12 and 14. For reasons he couldn’t quite explain, Lipkin avoided Ground Zero until this year. He thought that, perhaps, his family would make a trip there together. But his wife doesn’t want to. Time has done little to heal the wounds for Marjorie Miller, of Baldwin, whose husband, Joel Miller, worked on the 97th floor of the north tower as the assistant vice president of disaster recovery at Marsh & McLennan. The couple, both widowed with children from previous marriages, combined their families and married in 1996. Miller, who helps to organize Nassau County’s annual Sept. 11 remembrance ceremony, said she feels the need to participate in the event to honor her husband and to remember the lives needlessly taken. “It’s about them and the lives they missed out on,” Miller said. For some, the 15th anniversary has historical implications and is put in the context of an ongoing presidential election or terrorism overseas and at home. For Miller, the day is personal. For Debbie Rydzewski, the 9/11 anniversary is a reminder of how important it is to live every day like it’s her last. Rydzewski and her family attended Nassau’s remembrance ceremony Thursday to remember their close friend, Michael Kiefer, of Franklin Square, a member of Ladder 132 of Brooklyn in the New York City fire department. He was last seen at the Marriott Hotel heading for the south tower. The 25-year-old had served in the FDNY — his lifelong dream — for only nine months. Two days before Michael was killed, he competed in the Town of Hempstead Triathlon. Kiefer’s sister, Kerri Kiefer-Viverito, followed in his footsteps, competing in the event on Saturday Sept. 10. During Thursday’s ceremony, Kiefer-Viverito joined with the members of 13 other families in reading the names of Nassau’s 9/11 victims. She also sent a message to her brother. “We love you with all of our broken hearts,” she said. For the Valerio family, the lingering grief from 9/11 doesn’t get any easier to handle with each passing year, though it provokes different responses from Joe and his wife Patti Ann. 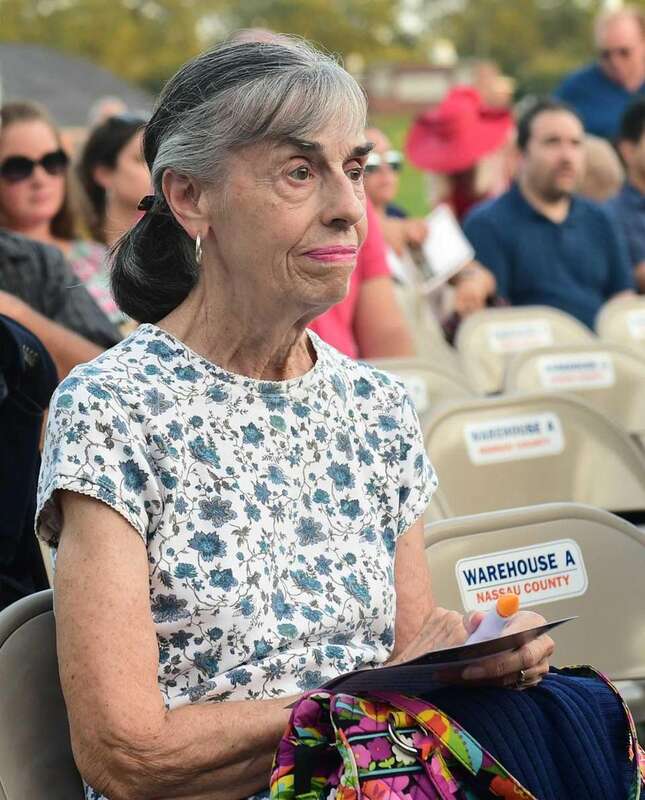 Patti Ann speaks and reads names at as many events as she can, including Nassau County’s annual event on Thursday, in honor of her brother Matthew James Grzymalski, a New Hyde Park resident who was among the nearly 3,000 killed that day. Grzymalski and his girlfriend Kaleen Pezzuti, 28, of Fair Haven, New Jersey, were working together as bond brokers for Cantor Fitzgerald, on the 105th floor in the north tower, when the planes hit. He was 34. Though some readers offered longer tributes to their loved ones on Thursday, Patti Ann kept hers short. “We miss you every day, Matty,” she said, tears in her eyes. Joe Valerio tries to attend the events to show support for his wife, he said. The retired FDNY firefighter says attending remembrance events is an important duty for those who lost a family member or were part of the rescue efforts, like him. But some days, he would rather not remember Sept. 11, 2001, at all. He prefers to avoid visiting Ground Zero, a pilgrimage his wife makes each year.